As a workaround, would the Program output help at all (located on the Send tab in Editor)? Or, perhaps setting up a profile for output directly to your program? 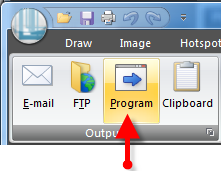 Choose Snagit > Output drop-down menu > Properties > Program tab. Thanks, Kelly, but unfortunately JIRA is a web-based app (like FogBugz) so I wasn't able to get it to work with the Output to Program option. Having a plugin like this for SnagIt would be fantastic. Is this on the roadmap at all? There is something like this for Firefox already but it doesn't allow you to use SnagIt. Jira has a plugin api so it may be possible to reuse one of the cms outputs (they use standard xml apis).. This is very much needed. In our company, hundreds of users are uploading many snapshots daily, and it is a real hassle right now. Please. Looking forward for updates. We also really need this feature. Please let us know if there is any progress on this. I will buy Snagit pro if you come out with this feature. this tool [http://sourceforge.net/projects/green...] comes with a plugin to upload straight to Jira and even Confluence. It's open source so maybe we can learn a thing or two from them and port it over to SnagIT? Create "Send to Jira" output accessory?. We currently use FogBugz and love the "Send to Fogbugz" output accessory in Snagit. We are moving our bug tracking from FogBugz to Jira and would like a similar control. Is it possible for us to develop this Snagit Output accessory and contribute it to the community? We have SnagIt and would very much like to use in connection to Jira and IE10. Capture is the standard tool in connection with Jira, but it doesn't work in connection with IE10 and 64Kbit. Are there any news about the feature? My company is moving from FogBugz to Jira. The loss of the 'Send to...' feature is very noticeable. Being able to sent to Jira would be a great new feature. +1, First thing I did when the company asked me to buy snagit- went looking for a JIRA plugin. Excellent program! Adding JIRA would make it the ultimate solution for our company! Please add this feature!! It's no fun going back to 1999 cutting and pasting images from Snagit to Confluence. This feature would save time and this is something that is a value add feature for most testing departments. Please consider adding this feature in your next release. +1 Jira is such a common tool!! NEED JIRA PLUGIN - PRETTY PLEASE!!!!! It seems that after 4 years (the start of this post) that the JIRA plugin isn't going to happen. Kinda sad, I have been using SnagIt since 2000 (v5.0) and am going to have to migrate to a new tool that will support JIRA. I'll be back if TechSmith implements this feature enhancement but until then it is off to something new (or old as the case may be). We're moving our organization away from Snag It to Atlassian's built in "Capture" tool. Pricing stinks with it, but its too important not to have a tight integration of capture tool with JIRA. Lost opportunity for Tech Smith I feel. I think they are underestimating how big JIRA is and how a plug in like this could ramp up sales for the Snag It product. JIRA has restful services and ca be integrated just as easily as others have done (like FogCreek). +1 for this. Why isn't the outputs open so ppl can add whatever they want? I was going to build it myself. I just went back to GreenShot for exactly this reason. This would be of great value. I also migrated from Fogbugz to Jira. This would be of great value. Also, it is good sales opportunity for Snagit as it can be marketed via Atlassian Marketplace. While this would be nice, it is pretty easy to paste an image, including annotations, from SnagIt into a JIRA issue. You don't need to save the image (from SnagIt Editor) to an external file. Just use the Copy All button in SnagIt to put the image into your system clipboard, then edit the Description field for your JIRA issue and use [Ctrl][V] to paste the image into your JIRA issue. A window, titled Attach Screenshot, will be presented which will allow you to save the image directly into JIRA as an attachment. JIRA will also include a thumbprint of the attachment in your Description field. If you just want the file as an attachment, you can delete the reference to the file from the Description field - the attachment will remain connected to your issue. You can do the same thing in the Comment field. Hope this helps some of you. It is not good practice in Jira to edit the original description when you are working a ticket. This solution only works when creating a ticket. A good Snagit/JIRA plugin would also allow you to add snapshots to an existing case. - Add a snag to an existing ticket by it giving me a search or knowing the last 10 JIRA issues I updated would be amazing!